This article is about the substance formed from trapped gas bubbles. For other uses, see Foam (disambiguation). "Foamy" redirects here. For other uses, see Foamy (disambiguation). 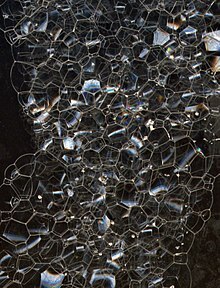 One scale is the bubble: material foams are typically disordered and have a variety of bubble sizes. At larger sizes, the study of idealized foams is closely linked to the mathematical problems of minimal surfaces and three-dimensional tessellations, also called honeycombs. The Weaire–Phelan structure is considered the best possible (optimal) unit cell of a perfectly ordered foam, while Plateau's laws describe how soap-films form structures in foams. is the radius of the orifice. As more air is pushed into the bubble, the buoyancy force grows quicker than the surface tension force. Thus, detachment occurs when the buoyancy force is large enough to overcome the surface tension force. The stabilization of a foam is caused by van der Waals forces between the molecules in the foam, electrical double layers created by dipolar surfactants, and the Marangoni effect, which acts as a restoring force to the lamellae. The Marangoni effect depends on the liquid that is foaming being impure. Generally, surfactants in the solution decrease the surface tension. The surfactants also clump together on the surface and form a layer as shown below. For the Marangoni effect to occur, the foam must be indented as shown in the first picture. This indentation increases local surface area. Surfactants have a larger diffusion time than the bulk of the solution—so the surfactants are less concentrated in the indentation. Also, surface stretching makes the surface tension of the indented spot greater than the surrounding area. Consequentially—since diffusion time for the surfactants is large—the Marangoni effect has time to take place. The difference in surface tension creates a gradient, which instigates fluid flow from areas of lower surface tension to areas of higher surface tension. The second picture shows the film at equilibrium after the Marangoni effect has taken place. with velocity in units of centimeters per second. ρ1 and ρ2 is the density for a gas and liquid respectively in units of g/cm3 and ῃ1 and ῃ2 is the viscosity of the gas and liquid g/cm·s and g is the acceleration in units of cm/s2. is the surface tension. The bubble shown below is a gas (phase 1) in a liquid (phase 2) and point A designates the top of the bubble while point B designates the bottom of the bubble. Since, the density of the gas is less than the density of the liquid the left hand side of the equation is always positive. Therefore, the inverse of RA must be larger than the RB. Meaning that from the top of the bubble to the bottom of the bubble the radius of curvature increases. Therefore, without neglecting gravity the bubbles cannot be spherical. In addition, as z increases, this causes the difference in RA and RB too, which means the bubble deviates more from its shape the larger it grows. Foam destabilization occurs for several reasons. First, gravitation causes drainage of liquid to the foam base, which Rybczynski and Hadamar include in their theory; however, foam also destabilizes due to osmotic pressure causes drainage from the lamellas to the Plateau borders due to internal concentration differences in the foam, and Laplace pressure causes diffusion of gas from small to large bubbles due to pressure difference. In addition, films can break under disjoining pressure, These effects can lead to rearrangement of the foam structure at scales larger than the bubbles, which may be individual (T1 process) or collective (even of the "avalanche" type). Being a multiscale system involving many phenomena, and a versatile medium, foam can be studied using many different techniques. Considering the different scales, experimental techniques are diffraction ones, mainly light scattering techniques (DWS, see below, static and dynamic light scattering, X rays and neutron scattering) at sub-micrometer scales, or microscopic ones. Considering the system as continuous, its bulk properties can be characterized by light transmittance but also conductimetry. The correlation between structure and bulk is evidenced more accurately by acoustics in particular. The organisation between bubbles has been studied numerically using sequential attempts of evolution of the minimum surface energy either at random (Pott's model) or deterministic way (surface evolver). The evolution with time (i.e., the dynamics) can be simulated using these models, or the bubble model (Durian), which considers the motion of individual bubbles. Observations of the small-scale structure can be made by shining the foam with laser light or x-ray beams and measuring the reflectivity of the films between bubbles. Observations of the global structure can be done using neutron scattering. A typical light scattering (or diffusion) optical technique, multiple light scattering coupled with vertical scanning, is the most widely used technique to monitor the dispersion state of a product, hence identifying and quantifying destabilization phenomena. It works on any concentrated dispersions without dilution, including foams. When light is sent through the sample, it is backscattered by the bubbles. The backscattering intensity is directly proportional to the size and volume fraction of the dispersed phase. Therefore, local changes in concentration (drainage, syneresis) and global changes in size (ripening, coalescence) are detected and monitored. Solid foams are a class of lightweight cellular engineering materials. These foams are typically classified into two types based on their pore structure: open-cell-structured foams (also known as reticulated foams) and closed-cell foams. At high enough cell resolutions, any type can be treated as continuous or "continuum" materials and are referred to as cellular solids, with predictable mechanical properties. An example of the use of azodicarbonamide as a blowing agent is found in the manufacture of vinyl (PVC) and EVA-PE foams, where it plays a role in the formation of air bubbles by breaking down into gas at high temperature.. The random or "stochastic" geometry of these foams makes them good for energy absorption, as well. In the late 20th century to early 21st century, new manufacturing techniques have allowed for geometry that results in excellent strength and stiffness per weight. These new materials are typically referred to as engineered cellular solids. Foam, in this case meaning "bubbly liquid", is also produced as an often-unwanted by-product in the manufacture of various substances. For example, foam is a serious problem in the chemical industry, especially for biochemical processes. Many biological substances, for example proteins, easily create foam on agitation or aeration. Foam is a problem because it alters the liquid flow and blocks oxygen transfer from air (thereby preventing microbial respiration in aerobic fermentation processes). For this reason, anti-foaming agents, like silicone oils, are added to prevent these problems. Chemical methods of foam control are not always desired with respect to the problems (i.e., contamination, reduction of mass transfer) they may cause especially in food and pharmaceutical industries, where the product quality is of great importance. Mechanical methods to prevent foam formation are more common than chemical ones. The acoustical property of the speed of sound through a foam is of interest when analyzing failures of hydraulic components. The analysis involves calculating total hydraulic cycles to fatigue failure. The speed of sound in a foam is determined by the mechanical properties of the gas creating the foam: oxygen, nitrogen, or combinations. Assuming that the speed of sound is based on the liquid's fluid properties leads to errors in calculating fatigue cycles and failure of mechanical hydraulic components. Using acoustical transducers and related instrumentation that set low limits (0–50,000 Hz with roll-off) causes errors. The low roll-off during measurement of actual frequency of acoustic cycles results in miscalculation due to actual hydraulic cycles in the possible ranges of 1–1000 MHz or higher. Instrumentation systems are most revealing when cycle bandwidths exceed the actual measured cycles by a factor of 10 to 100. Associated instrumentation costs also increase by factors of 10 to 100. Most moving hydro-mechanical components cycle at 0–50 Hz, but entrained gas bubbles resulting in a foamy condition of the associated hydraulic fluid results in actual hydraulic cycles that can exceed 1000 MHz even if the moving mechanical components do not cycle at the higher cycle frequency. ^ Lucassen, J. (1981). Lucassen-Reijnders, E. H. (ed.). Anionic Surfactants – Physical Chemistry of Surfactant Action. NY, USA: Marcel Dekker. ^ Morgan, F. "Existence of Least-perimeter Partitions" (PDF). ^ a b Gibson, Ashby (1999). Cellular Solids: Structure and Properties. Cambridge, UK: Cambridge University Press. ISBN 9781316025420. ^ Wu, Qiong. "Highly porous flame-retardant and sustainable biofoams based on wheat gluten and in situ polymerized silica". Archived from the original on 20 November 2016. Retrieved 19 November 2016. ^ Reyes-Labarta, J.A. ; Marcilla, A. (2008). "Kinetic Study of the Decompositions Involved in the Thermal Degradation of Commercial Azodicarbonamide". Journal of Applied Polymer Science. 107 (1): 339-346. doi:10.1002/app.26922. ^ Reyes-Labarta, J.A. ; Marcilla, A. (2012). "Thermal Treatment and Degradation of Crosslinked Ethylene Vinyl Acetate-Polyethylene-Azodicarbonamide-ZnO Foams. Complete Kinetic Modelling and Analysis". Industrial & Engineering Chemistry Research. 51 (28): 9515-9530. doi:10.1021/ie3006935. ^ Reyes-Labarta, J.A. ; Marcilla, A. (2008). "Differential Scanning Calorimetry Analysis of the Thermal Treatment of Ternary Mixtures of Ethylene Vinyl Acetate, Polyethylene and Azodicarbonamide". Journal of Applied Polymer Science. 110 (5): 3217-3224. doi:10.1002/app.28802. ^ Reyes-Labarta, J.A. ; Olaya, M.M. ; Marcilla, A. (2006). "DSC Study of the Transitions Involved in the Thermal Treatment of Foamable Mixtures of PE and EVA Copolymer with Azodicarbonamide". Journal of Applied Polymer Science. 102 (3): 2015-2025. doi:10.1002/app.23969. ^ Ashida, Kaneyoshi (2006). Polyurethane and related foams: chemistry and technology. CRC Press. pp. 79–81. ISBN 978-1-58716-159-9. Archived from the original on 2017-02-17. Look up foam in Wiktionary, the free dictionary. Wikimedia Commons has media related to Foam.